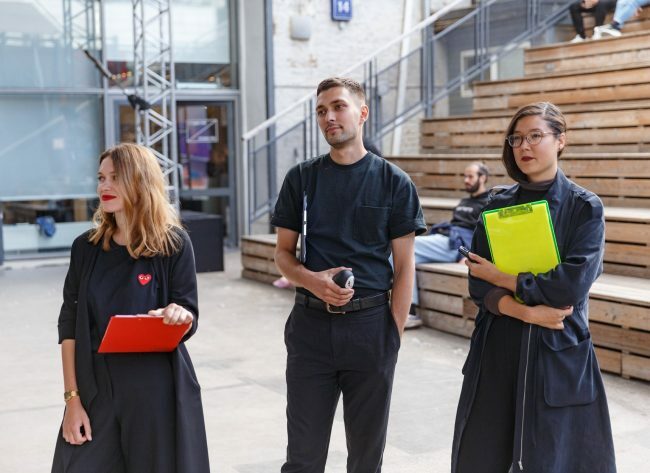 ‘Geocinema’ is a practice that came to being during The New Normal a speculative urbanism think-tank in Strelka Institute for Media, Architecture and Design. By focusing on various sensing techniques— from fragmented satellite and ground station data transfers to systems that are able to predict seismic activities— the collective is interested in the feedback loops between processes of image making, production of knowledge, geopolitical imaginations and terraformation. Solveig Suess is a designer, researcher and filmmaker, investigating networked conditions and ecological resistances across uneven geographies of circulation through text, sound and image. She received her BA in Visual Communications at Glasgow School of Art, her MA at the Centre for Research Architecture, Goldsmiths University of London. Asia Bazdyrieva is an art historian and researcher with a specific focus on the ideological underpinnings that are embedded in the spatial organisation and ecologies of public spaces. She studied analytical chemistry in the University of Kyiv and art history in The City University of New York as a Fulbright grantee. Alexey Orlov is a video artist who works on various projects as DoP, editing director, motion designer, producer and post production supervisor.